Sometimes the simplest things are the best… This definitely includes my lunch today! A piping hot mound of tubular spaghetti, piled high with grated Gouda cheese. 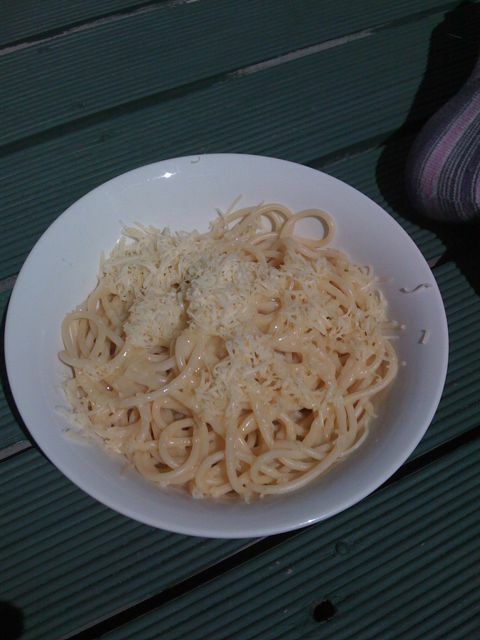 I enjoyed this simple culinary delight out on my deck this afternoon in the sunshine (with my cats next to me ready to pounce on any leftover cheese…) and, excluding the dread of my 4 exams coming up, life couldn’t be better. This entry was posted on October 20, 2008 at 12:06 pm and is filed under Snacks. You can follow any responses to this entry through the RSS 2.0 feed. You can leave a response, or trackback from your own site. I prefer this to any fast food chain food . Yummy!